Hi friends we meet again.Now I have a new trick which is very useful to you.If you are in web sometimes you have to see a webpage for longer times. At that time your phone screen locks unfortunately.To avoid that trouble different companies introduced new apps. Samsung phones have a pretty nifty little feature called Smart Stay that will prevent your screen from turning off while you're actively using your device. Trouble with this is that it's exclusive to Galaxy devices and it uses a ton of battery since it monitors the front-facing camera to detect when you're facing the screen. The development team at TeqTic has an innovative app that will replicate this feature on any Android device—without destroying your battery life. By monitoring your phone's accelerometer to detect even the most subtle movements, their app will see to it that your screen never turns off as long as you're using your device. TeqTic's app is available for free on the Google Play store. Search "KinScreen" to get it installed, or use this link to jump straight to the install page. When you first launch KinScreen, you'll notice two options at the bottom of the screen. These are not required for the basic functionality, but can be helpful nonetheless. 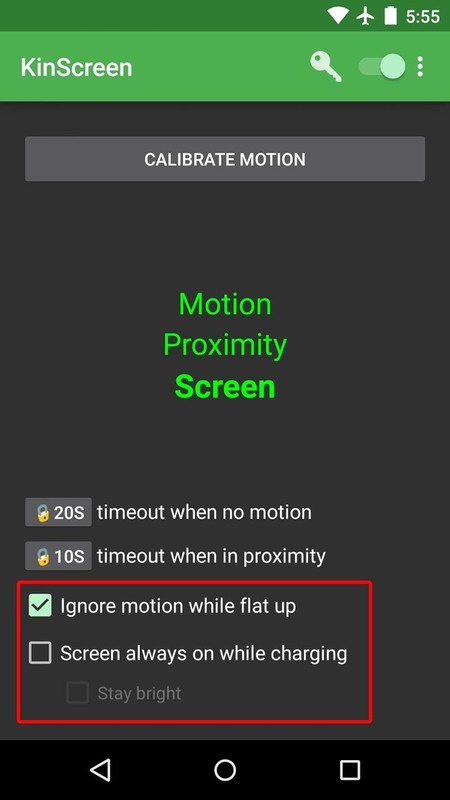 "Ignore motion while flat up" will see to it that KinScreen does not disable your display timeout when you leave your device laying on a couch cushion, for instance. KinScreen will also let you disable the screen timeout while your phone or tablet is charging if you enable the "Screen always on while charging" option. Other options, such as custom timeouts for motion and proximity sensors, can be unlocked with an in-app purchase of $1.99. KinScreen uses two sensors in your device to seamlessly switch between screen timeouts of 10 seconds, 20 seconds, and indefinite. The accelerometer is used to detect when you're holding your device, in which case the screen will not be turned off. 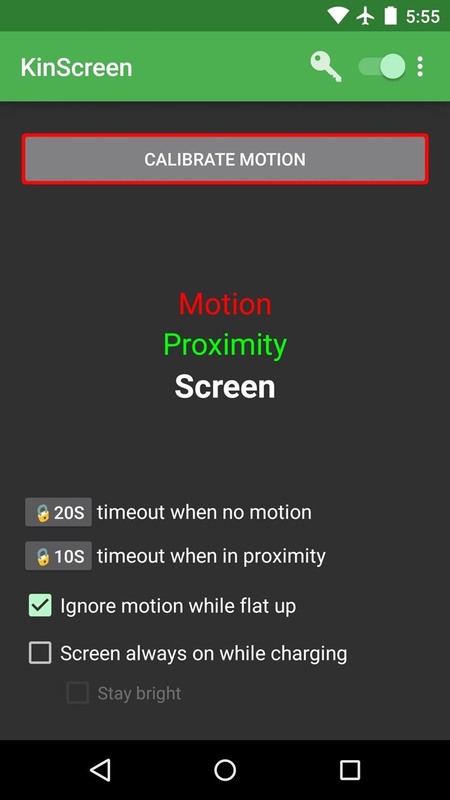 When your device is still or on a flat surface, the timeout switches to 20 seconds automatically. If you put your device in your pocket or purse, the proximity sensor service will kick in and the timeout will be set to only 10 seconds. Of the two sensors used, the accelerometer is the only one that must be calibrated—this ensures that KinScreen has a good baseline of what "perfectly still" is. To begin calibration, tap the "Calibrate Motion" button at the top of the screen. From here, lay your device on a flat surface and tap "Start." 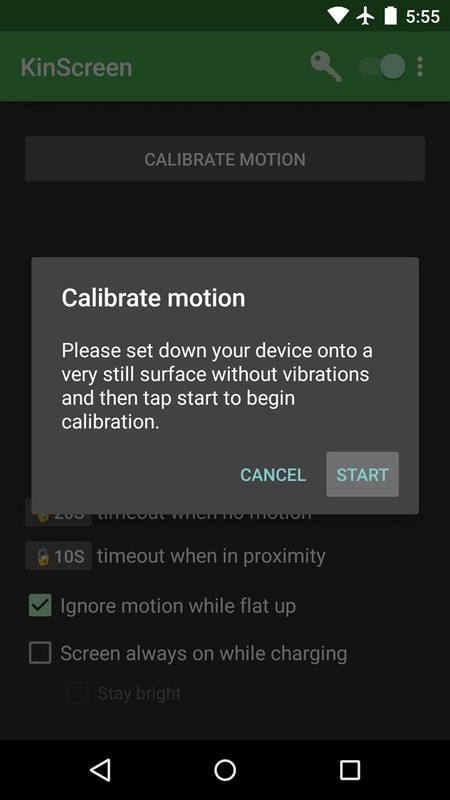 The calibration process will take 10 seconds, during which time you should not touch your device or bump up against the surface it's laying on. When it's done, you can leave the app and go about using your phone as you normally would. From now on, your screen will stay on as long as you're holding your device in your hand. If you put your device in a pocket, purse, or even lay it face-down, the screen will turn off automatically within 10 seconds. Otherwise, with your device laying face-up on a desk or table, the screen timeout will be set to 20 seconds. That's enough.Now you don't have to press power button while you're working.